Call (877) 782-2294 to inquire. Send us your list of provider NPIs (or UPINs, state license numbers or provider phone numbers), and we'll send back the complete data for those providers. For the specific healthcare providers you submit (as a list of NPI, UPIN or state license numbers), our Hygiene & Enrichment product delivers the most up-to-date contact information, including mailing address/phone/fax and practice address/phone/fax, provider names and AKA names, all reported taxonomy codes, UPINs and other identifiers, plus all other data contained in the the National Plan & Provider Enumeration System (NPPES) for your provider file, updated monthly by the Centers for Medicare and Medicaid Services (CMS). Other submission criteria can be accommodated, such as UPIN codes or state license numbers instead of NPI numbers; call (877) 782-2294 for more information. Use this data, which includes the complete set of reported provider identifiers, to improve the speed and accuracy of crosswalks, optimize claims for speedy payment, reduce days in A/R, improve system efficiencies and reduce HR costs, and for business development and research applications. PRICING: Pricing is based on the number of records submitted for hygiene and enrichment, and on the presence in the submitted data of unique identifiers (NPI, etc.) or lack thereof. Pricing is available for the standard CarePrecise dataset or for an extended premium dataset. Call (877) 782-2294 ext. 2 to discuss your needs. Note: Advanced record linkage based on name and address information is priced differently than direct match, on a per-project basis. In addition to standard CarePrecise Select services, CarePrecise offers additional record linkage services that can deduplicate records, match and merge records from different databases, append current provider data to your CRM and house lists and much more -- even without a unique identifier such as an NPI number. Our advanced record linking technology can work with basic name and address data to build a highly effective match code. Pricing differs depending on the condition of your data and other factors. Contact us to discuss your need. APPLICATION: Used by hospitals, billing services, payers and vendors to clean and enrich provider files with updated and additional information directly from providers' federal records (combined federal NPPESThe Centers for Medicare and Medicaid Services (CMS) maintains the National Plan and Provider Enumeration System (NPPES) database. All healthcare providers who are HIPAA covered entities must obtain a National Provider Identifier (NPI) by reporting their information via the NPPES, and updating it when it changes. This represents virtually all of U.S. physicians, hospitals, and other providers who accept insurance or are associated with a hospital. CarePrecise Access Complete includes every NPI record., PECOSThe federal database containing information on healthcare providers who are eligible to bill Medicare., LEIE List of Excluded Individuals/Entities (LEIE): The federal database maintained by the HHS Office of Inspector General containing information on providers who have been barred from billing Medicare due to fraud or controlled substance conviction, patient neglect or abuse, and other convictions and delinquencies. databases). DELIVERY: Data is in the form of relational database tables, delivered in both MDB (Microsoft Access) and CSV format. Most orders can be filled within one business day. Depending on the size of the enriched file and customer preference, delivery may be via email, FTP download, or, for an additional charge, on CD or DVD. See the Date Structure table below for the specific files and fields that will be delivered. Data returned is subject to availability of provider-reported identifiers in the current CMS NPPES database. NPI (or UPIN or License Number or Telephone) The provider's 10-digit NPI number, or UPIN code, or the state license number (plus the licensing state, as shown below), or the ten-digit telephone number (3-digit area code and 7-digit number). Licensing State For state license number submissions only. 2-character state abbreviation. ID OPTIONAL: Your internal identifier, if different from the NPI. This will be returned with your output file. ORDER: To order, please call for assistance, (877) 782-2294. DATA STRUCTURE: CarePrecise is distributed as normalized relational database tables. Custom projects may include the following data fields. Click for a printer-friendly version of the fields list. CPAC (CarePrecise Access Complete) data is sourced and cross-matched from the NPPES, PECOS and LEIE datab, keyed on the NPI. Every record has a unique NPI, and the NPI is used to link the relational tables together. The CPAC dataset is updated monthly. 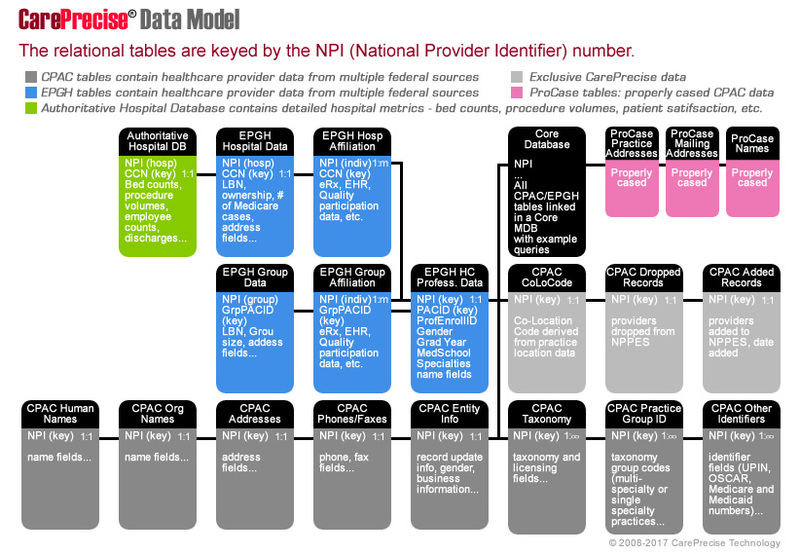 The NPI is a unique 10-digit numerical code assigned to every HIPAA-covered healthcare provider, including individuals and organizations, by the U.S. Department of Human Services, Centers for Medicare and Medicaid Services (CMS). MailState Provider Business Mailing Address State Name The federal data contains variations on state codes, abbreviations and full state names; we conform this field to standard 2-character state codes where possible. PracState Provider Business Practice Location Address State Name The federal data contains variations on state codes, abbreviations and full state names; we conform this field to standard 2-character state codes where possible. MDB and CSV formats One-to-many table. Table is not provided in custom data pulls (CarePrecise Select services). SecondaryPracState State Name The federal data contains variations on state codes, abbreviations and full state names; we conform this field to standard 2-character state codes where possible. EIN Employer Identification Number (EIN) Not currently populated. CMS is not yet providing tax numbers of this type. DeactDate NPI Deactivation Date Not populated because records in the current dataset are not deactivated. This field IS populated in the separate delta table tEntity_DEACT, described below. IsSoleProp Is Sole Proprietor Y indicates provider operates as a sole proprietor business. The exclusion type from the LEIE database, explaining the reason that a provider was barred from billing Medicare. Fields with a Y in the Warning field will display this code. The code's definition can be found at this link. A CSV file listing these exclusion descriptions is included in the CarePrecise Access Complete CSV download file. The date of the exclusion from the LEIE database, where reported. Group From NPPES group taxonomy data. Y= this provider reported that it operates as either a multi-specialty group or single-specialty group. OthLN Provider Other Last Name "AKA" name: Nee name, nickname, etc. AuthLN Authorized Official Last Name (Contact person for a Type 2 organization record) Name of the provider's authorizing official, if other than the listed individual provider. For organizations (Entity Type 2 records), this is the contact name. Alternative org names beyond those lited in tOrgNames; MDB and CSV formats. One-to-many table. (Provider Taxonomy codes indicating specialties and subspecialties for Type 1/individual providers, and facility types for Type 2/organization providers; MDB and CSV formats). One-to-many table. Lic Provider License Number For Type 2 (organization) providers, License is no longer collected as of 9/10/2018. LicState Provider License Number State Code For Type 2 (organization) providers, License is no longer collected as of 9/10/2018. TaxoSwitch Healthcare Provider Primary Taxonomy Switch (Primary specialty indicator) "Y" means this is the provider's primary specialty or facility code. Tnum The number of the NPPES taxonomy field (1 through 15). If a primary taxonomy is not indicated, it may be useful to assume that the first-listed code (1) is primary. The source data (NPPES) permits group codes to be reported in up to 15 fields in this section. CarePrecise creates a one-to-many table, listing each of a provider's reported taxonomy group codes in a separate record. The Gnum is the NPPES Group Taxonomy field number in which the code was reported, allowing the code be matched with the specific group specialty in the tTaxo table. For instance, a code in tTaxoGroup field Gnum 3 indicates a group practice of the specialty reported in Tnum 3 in the tTaxo table. CMS does not report the group codes in the taxonomy section (which appear in our tTaxo table) because they represent an additional layer of information on any one or more of the tTaxo codes. Provider CoLoCode™ (co-location code, a CarePrecise algorithmically derived* exclusive). The NPI and CoLoCode comprise the dual relational key for this table. The NPI identifies the provider record, and the CoLoCode identifies the physical location. The CoLoCode is an up to 40-character string that stands in for detailed location data, and is not intended to be sensical to the human viewer. This code is an algorithmically derived conformation of the provider's practice location, permitting identification of providers who practice at the same location, for instance, physician groups, dental groups, radiology groups, etc. By using this table in conjunction with the tTaxoGroups table, it is possible to visualize the group entity (generally an organization) and its provider members. Count of providers matching this co-location (algorithmically derived* conformation of the provider's practice location; see tCoLoCodes above). Indicates the number of providers practicing at this co-location. DateDiscovered The CarePrecise processing date on which the added provider record was discovered. Corresponds to the most recent previous CMS update date on which the added provider data was included in the NPPES database. Unduplicative index key is dual; NPI and DateDiscovered. DateDiscovered The CarePrecise processing date on which it was discovered that the provider record was dropped from the NPPES database. Corresponds to the most recent previous CMS update date on which the provider data was dropped from the NPPES database. Unduplicative index key is dual; NPI and DateDiscovered. ProvName This is a generated field based on EntityType. PracState Provider Business Practice Location Address State Name The federal data contains variations on state codes, abbreviations and full state names; we conform this field to standard 2-character state codes. A small number of non-US postal addresses remain nonconforming. LN Last name (Type 1 providers) This table, sourced from the LEIE, lists all provider records in the federal excluded providers database. A provider may be excluded (barred from billing Medicare) for reasons of a criminal nature, among other reasons. This table contains no relational key; however, it is used to produce the Warning field in the tEntity table, which does include the provider's NPI. This table should be referenced for backup information. NPI National Provider Identifier This table is provided by CMS, listing all NPI records that have been deactivated and the deactivation date. Unduplicative index key is dual; NPI and DeactDate. The Delta tables are contained in a separate database included in the CarePrecise Access Complete dataset, named NPPES_Delta. They contain near-complete data on providers whose records have been deactivated by CMS for various reasons, including retirement, death, or for any of several infractions. These tables contain the same fields as the standard provider data tables as defined above for their namesakes, and are populated with the data from previous data releases, with the deactivation date populated in the tEntity_DEACT table's DeactDate field. Additional Data Included with Extended Professional, Group and Hospital (EPGH)/CPAC Master Bundle and CarePrecise Platinum. Data is sourced from PECOS, Physician Compare, Hospital Compare and other CMS data, and is updated monthly. Provider records are a subset of the CPAC records, with approximately 600,000 physician records and 500,000 other providers. The EPGH is not sold separately, and is available only as a bundle. No time stamp is provided for EPGH updates, and no historical data is included. Only active providers (have appeared on a Medicare claim in the past twelve months) are included in the EPGH dataset (unlike the CPAC dataset, which includes all US HIPAA-covered providers). EPGH data is available for approximately 560,000 physicians, and 300,000 other professionals, and is growing. The hospital data in EPGH provides an unduplicated listing of hospitals and their highest priority NPI number, and is linked to each hospital's affiliated professionals/physicians and practice groups. EPGH practice group data makes it possible to see the multiple locations at which an individual provider practices. Link to professional's data in the CPAC databases above. This ID is unique per professional (physician, PA, etc.). Link to practice group affiliations through the tExtended_GroupProfessional table, and is a link to upcoming practice group quality data. ProfEnrollID Professional Enrollment ID Unique ID for the individual professional enrollment that is the source for the data in the record. One professional may have multiple records in this table as a result of multiple PECOS enrollments, each of which may have its own hospital and practice group affiliations. LN Last Name In most cases the name fields here will be duplicative of the fields in tHumanNames, but these are sourced from the PECOS system rather than the NPPES. Cred Credential Medical credential such as MD, DO, DPM, etc. Links Group and Individual records within Extended tables. This ID is unique to each practice group. This key will link to group practice quality data soon to be released. Links practice groups in Extended tables to CPAC data above. Algorithmically derived*; not available for all group records. Use the GroupPracPACID to link individuals with their groups through the tExtended_GroupProfessional table. CountGroupPracMem Number of Individual Professionals affiliated with Group Practice This count is limited to individuals within the Extended domain; others may be found within the standard CPAC tables via CoLoCode. Line2Suppress Marker that address as reported may be incomplete A peculiarity of the federal source data. CoLoCode Derived algorithmically* based on location data May be used to identify additional affiliated individuals within the NPPES data above. (Many-to-Many table linking group practices with individual professionals. One or more individuals per group, and may be one or more groups per individual. Extended information on group practices' individual providers, incl. whether accepts Medicare assignment, participates in various federal medical quality programs. MDB and CSV formats). Many-to-many table. Link to individual's data in CPAC tables above and in tExtended_Professional table. This ID is unique to the individual professional. Link between practice groups and their members in the tExtended_Professional table. This ID is unique to the practice group. AcceptsMedicareAsmt Y = Accepts Medicare approved amount as payment in full. M = May accept Medicare Assignment. All providers in this table are enrolled to bill Medicare, and have done so within the past 9 months, but may not still be accepting new Medicare patients, and may not accept Medicare amount as payment in full. Participates in the eRx Incentive Program, a pay-for-reporting program to encourage physicians, other providers to use electronic prescribing of medications. PQRS Participates in the Medicare Physician Quality Reporting System (PQRS) Incentive Program - a pay-for-reporting program that gives eligible professionals incentives and payment adjustments if they report quality measures satisfactorily. Quality data on individual professionals is not yet available in this product, but using the relational keys in this table, you will be able to access it when it is released. EHR Participates in the Medicare Electronic Health Record (EHR) Incentive Program - provides incentives and payment adjustments to eligible professionals who use certified EHR technology in ways that may improve healthcare. Y in this field means provider is participating in federal EHR incentive program, though may use an EHR system even if not affirmative in this field. Link between hospitals and their affiliated individual physicians, etc. This ID is unique to each hospital recognized in the CMS PECOS system. If a hospital is eligible to bill Medicare (whether or not sanctioned), and is a general hospital (Acute Care, VA, Critical Access or Children's hospital), it is in this table. This key links to the exhaustive federal hospital quality data, optionally available for download at no cost to EPGH users. Link to one of the hospital's records in CPAC tables above. Hospitals may have as many NPI numbers as they believe they need for their particular business circumstances, and tend to have many. We have listed here the Priority NPI, based on the hierarchical Taxonomy coding system, selecting first the NPI of the record containing the top (parent) taxonomy code for the hospital type, and, if not present, the NPI from the first-listed record for the hospital. Algorithmically derived*; not available for all hospital records. CoLoCode Derived algorithmically* based on location data May be used to identify additional data within NPPES tables above. (1-to-Many table linking Hospitals with physicians and other providers; up to five hospitals per individual; MDB and CSV formats.) Many-to-many table. Link to hospital details in tExtended_Hospital via CCN, and to full hospital quality data soon to be added. The ProCase™ module contains the Name and Address data in the CPAC package in properly-cased form. It is available as an add-on to the standard data package (CPAC), extended data package (Master Bundle), Gold or Platinum packages. ProCase is not available as a stand-alone product. Link to data in the CPAC and EPGH databases above. The Authoritative Hospital Database™ (AHD) contains detailed data on US hospitals, including bed counts, procedure volumes, medicare billings, patient satisfaction rankings, etc. The Authoritative Hospital Database is available separately, but can be linked to EPGH and CPAC data above keing on the CCN and NPI fields, respectively. Note that neither CarePrecise Platinum, CarePrecise Gold, or the Master Bundle include the AHD. No time stamp for data updates is provided in the AHD, nor is historical data available. Link to data in the EPGH databases above. Link to data in the CPAC and EPGH databases above. Algorithmically derived*; not available for all AHD records. The contact name fields in the AHD are then populated from the matched NPI record. EmergencyService Does have emergency service? CoLoCode Algorithmically derived* from location data. Used to match records. Additional data included in the CP ListMaker software component of CarePrecise Gold, and CarePrecise Platinum, sourced from USPS and U.S. Department of Commerce, and independent CarePrecise research. Data is periodically. These data are available only as part of the CP ListMaker and CarePrecise Gold/Platinum products, and are not sold separately. Note that neither the CP ListMaker application is included in special licensing for Derivative Products or Redistribution. Wealth Numerical indicator of the relative wealth/poverty of the provider's immediate service area (5-digit zip). Wealth/poverty level is show as a percentage of the Federal Poverty Level (FPL) for the particular geographic area. Currently up to 12 levels are present in the data; additional levels will be included when data for those more extreme wealth levels are present. RuralUrban Indicates Rural (R), Urban (U) or Other (O) status for the provider's immediate service area (zip). Other indicates suburban or small city status. Additional data tables included in CarePrecise Gold are used by the included SharpMail™ tool to produce correctly-cased names and addresses and correctly-genderized and -prefixed salutations. Printer-friendly version of the fields listing. * Marked above by an asterisk (*), algorithmically derived data in the CPAC dataset includes data that is extracted/mined from the source databases, but which has a margin of error and should not be relied upon as conclusive. Record linking algorithms are used to enrich our data when direct correlation (via a unique identifier field) is not available, using available information in name, address, phone, taxonomy, and other fields. In particular, some of the older data on providers excluded from billing Medicare (from the HHS Office of Inspector General's excluded providers database) can only be linked to NPI records by this means. Please note that when matches are found, there may be instances where an individual or firm has the same or similar name and location information as an excluded provider but is actually a different party. Therefore, it is important that you verify a potential match with the debarring agency identified in the record information. See the disclaimer appearing at the bottom of the documentation page. Not all fields in all records are populated with data. Providers may update data in their record using the federal NPI registry website. CarePrecise Technology LLC reserves the right to make changes in the data and data structure as it deems necessary to preserve the quality of the product. Please read the Notice at the bottom of the page https://www.careprecise.com/help/ for additional information about the data. SYSTEM REQUIREMENTS: For use as CSV data files, database software that can open comma delimited files is required. For operation as a single joined dataset running in Microsoft Access, Microsoft Access 2003 or later is required. You should have 2 gigabytes of RAM (4GB recommended). Approximately 2GB of disk space shouild be allooted for storage of the MDB files, plus additional disk space when manipulating the data. Because the files are quite large, we recommend disk defragmentation prior to copying the files to your computer for best performance. The CSV files may be imported into any application that supports comma separated value files and supports approximately 5.8 million rows of data (more for the Taxonomy and Other ID tables). OTHER FORMATS: If you need a different data structure or file format, we can probably accommodate. Contact sales@careprecise.com. OTHER SERVICES: We can match your provider list of NPI numbers with their full NPPES record, or compile lists of specific specialties in specific zip codes. Contact sales@careprecise.com.